This may come as a surprise to some, especially after Tuesday's election results, but President Obama actually had a rather good October in his job approval polling. Now, I realize that this is really no more than a side issue this week (of all weeks), but we're already overdue for the poll-watching this month, so bear with me. I realize that the biggest "poll" was the election, but this column has always focused solely on creating a monthly average of the public opinion polling on Obama's job approval. Where, as I said, Obama had a pretty good month. Let's take a look at the chart. The news media spent the first half of October absolutely freaking out over Ebola, which had the obviously-intended effect of also freaking out a large slice of the population, causing them to pay more attention to the news media (see how that works?). The mainstream media then got bored with the story and dropped it (because the predicted millions of deaths never seemed to materialize), and moved on to covering the midterm elections, which dominated the last half of the month. It's rare to summarize an entire month so easily, but it really was a two-story month. Even the war with the Islamic State got short shrift. Obama's job approval rating benefited from a "rally 'round the president" effect, perhaps due to the new war, and perhaps due to the Ebola panic. This bumped his numbers up at the beginning of the month, but only briefly. For the entire month, Obama wound up improving his monthly average job approval rating to 42.1 percent, a jump of 0.6 percent from September. His monthly average job disapproval rating fell to 53.4 percent, a more modest gain of only 0.1 percent for the president. To put it in perspective, however, this was the first month Obama made gains in both categories since May, and only the fifth time this year he's managed to do so. 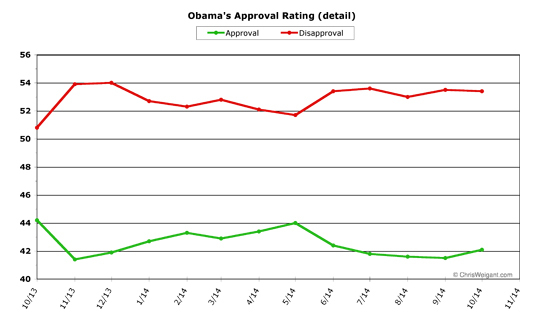 Obama's monthly average approval rating hasn't been above 42.0 percent since June, for more perspective. President Obama was not actually in the news much in October. The Ebola story centered on federal agencies and state executives much more than the White House, and then during the end of the midterm election season, few Democrats invited Obama to campaign with them. 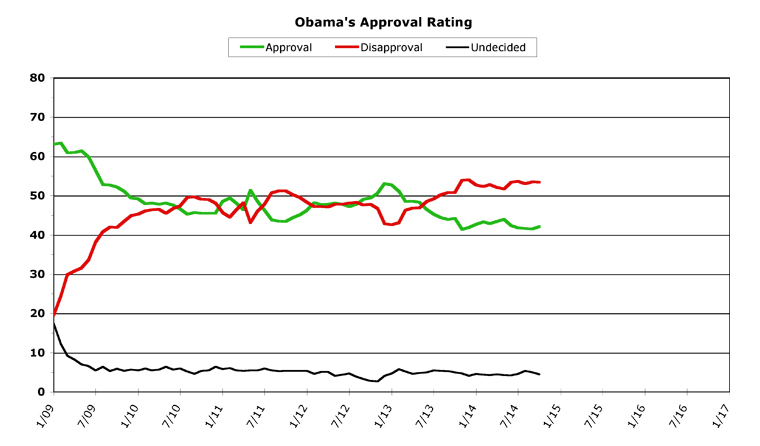 Obama's job approval ratings went through a slow sine wave in October. They rose significantly at the beginning of the month to hit an average of 43.3 percent in the first week -- significant because Obama hasn't charted a daily average above 43.0 percent since June. This bump was short-lived, though, and his daily average fell down to 41.2 percent late in October. By the end of the month, he had risen back to almost match where he had started (Obama started October at 42.2 percent, he ended at 42.0 percent). This wave is partially explained by how RealClearPolitics does their own daily averages (they factor in roughly the past two weeks of polling), but not entirely. All month long, Obama was still averaging about a half a percent better than the previous month. His average began at 0.7 percent better, went up to 1.3 percent better, and then fell back to 0.6 percent better, showing improvement over September all month long. 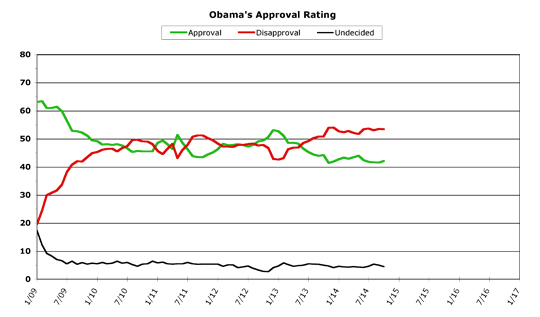 Obama's disapproval ratings followed a reverse trajectory. Starting at a 53.4 percent job disapproval daily average, Obama's numbers fell to 52.3 percent then rose again to 54.7 percent before ending the month precisely where he started, at 53.4 percent. 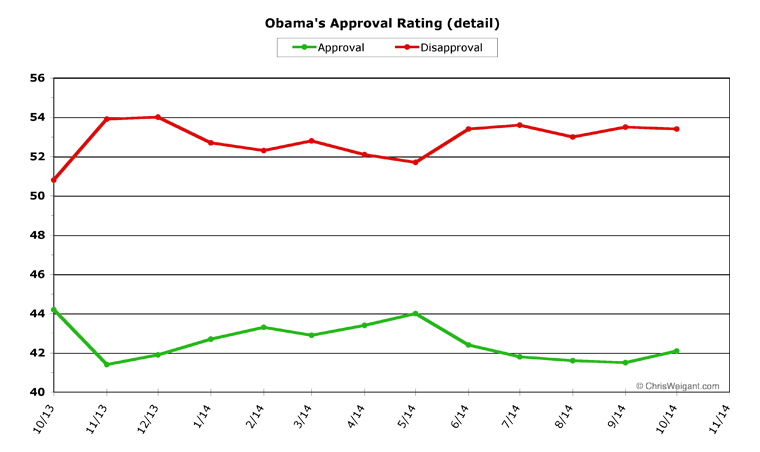 Unlike his approval rating, however, this didn't signify much of a change from last month. Obama started the month with a 0.1 percent gain, got up to a 0.7 percent improvement, but then fell back to only the 0.1 percent he started with. Still, his numbers remained positive all month long, and never fell to the negative range at all. Looking for future trends is tough this month, because a sine wave doesn't really show much of any clear trends. One pretty safe bet is that Obama will be more prominent in the news in the next few months (at least, more prominent than he was in October). But the sparks aren't really going to fly much during the lame-duck session of Congress, they'll largely begin in January of next year when the new Congress is seated. There is one major exception to this, however: immigration. Obama's long-promise (and oft-delayed) executive action on immigration reform looms large. Nobody outside of the White House knows when it'll happen, but if it does it will occur in the next two months (Obama's latest promise was "before the end of the year"). President Obama has already signaled he is going to act. In the press conference after the midterm election, he specifically said he's still going to act. What his action will encompass is another open question -- how big will Obama go? Whatever new policy he announces, however, it is guaranteed to be big news. As will the Republican apoplexy which will immediately and inevitably follow. How this will play out in the court of public opinion is anyone's guess. Will Obama alienate independent voters by changing deportation policy? Will he regain support from Latinos who have been disgusted at the political delays in the new policy? These two trends will try to counteract each other, but it's likely that Obama's polling will see an effect no matter which way it turns. My guess is that the announcement will come just prior to either Thanksgiving or Christmas, to capitalize politically on the feelings of family and good cheer in the populace. Is it just me, or is the presidential primary season off to a slow start? I just hope we don't nominate Martha Coakley. She's apparently unbeatable in Democratic primaries. But humor aside, I think ya'all better get used to it.. The American people are overwhelmingly against Amnesty for criminals.. This was one of the clear points of the MidTerms. The reasons for Obama's embrace of criminals is two-fold.. So, I am not sure the best way to proceed.. It's a foregone conclusion that Amnesty for 10 million criminals will be a disaster for this country.. You can't drop 10 million new workers into the job pool that is ALREADY way over-saturated with workers and expect good things to happen..
"President Obama should work with Congress rather than around Congress on immigration and separately." "Does NOT want Obama to enact an executive amnesty on his own. " What's our POTUS going to do about it?? For all the hand wringing/rejoicing going on, the party holding the White House has tended to get clobbered in the senate races. Eisenhower lost 12 seats as a lame duck! This, and the latest Obama approval uptick, plus the fact that only 36 senate races were held, in 34 states, suggest it's more legit to call the outcome a Red/Purple state referendum. I know, this gets in the way of a catchy meme....but those are the facts. Eisenhower lost 12 seats as a lame duck! If you ONLY look at the Senate races, you would be correct.. In each and every aspect of this election, the Democrats were decimated..
Like we are discussing in the previous commentary, you CAN find a shiney nugget here and a shiney nugget there.. I won't begrudge you that.. But you can't point to those very VERY few shiney nuggets and claim those have any kind of relevance to the totality of the entire election..
"Make no mistake. I may not be on the ballot this election but my policies, each and every one of them, ARE on the ballot"
If ya'all want to do that, I will quit calling ya'all on it.. I won't begrudge ya'all the illusion that this Nuclear Shellacking is actually not a bad thing for Democrats..
WASHINGTON (Reuters) - The U.S. military has drawn up plans to significantly increase the number of American forces in Iraq, which now total around 1,400, as Washington seeks to bolster Iraqi forces battling the Islamic State, U.S. officials told Reuters on Friday. What do you think Iraq War III will do to Obama's poll numbers??? Supporters of the health care law were flabbergasted and accused the court of verging into politics. The news came a week ahead of the second open enrollment season for subsidized private health insurance under the law. "All of the general guidelines that the court traditionally uses in determining whether it should schedule an appeal are totally absent in this case," said Ron Pollack, executive director of Families USA, an advocacy group that supported Obama's health overhaul from its inception. Pollack called the court's action "an unusual political act." The legal challenge to the subsidies is "the most serious existential threat" facing the Affordable Care Act, added Pollack. So, logically, if the SCOTUS were to side with the Government, they wouldn't have heard the case..
Is there a flaw in my logic?? Latest reports show that there won't be any word from the St Louis County Grand Jury until next weekend at the earliest..